Paintless Dent Repair is the revolutionary process of removing dents, dings, creases, and hail damage from vehicles without the inconvenience and expense of traditional body shop repair methods. Also known as PDR, choosing paintless dent repair will maintain the manufacture's original finish. This can be done in a fraction of time compared to traditional collision repair methods. The best detail in the Twin Cities is available at Maplewood Auto Salon! There is no need to repaint the vehicle and the original factory paint finish remains the same because in the the paintless dent repair process dents are pushed out from the underside of the body panel. Why choose Paintless Dental Repair from Maplewood Auto Salon? Many area body shops and dealerships utilize our PDR services to complete their paintless dent repairs for the their customers. The reason for this is that PDR is an art that takes a long time to master. Many dents can be removed without leaving a trace when repair work is performed by our skilled technician using the techniques where dings can be removed with the original paint in place; PDR is also effective for hail damage. Minor dents and dings can be repaired in one to two hours. What is Paintless Dent Removal - Paintless Dent Repair - PDR? “Paintless dent removal” is a process of removing minor dings, dents, and creases from auto body panels that may have been caused by hail or objects hitting a panel (such as the all too common "door ding" or "parking lot dent"). The PDR process requires no sanding or painting and leaves the factory paint intact. Can most damage be repaired with PDR? A wide array of damages can be repaired using PDR, but if there is broken paint then PDR may not be the solution. How is PDR done, what is the process? PDR is typically is performed by utilizing metal rods and picks to push the damage panels from the inside of the body panel. If there is no access it may be possible to use a specialized glue to pull the dent from the outside of the panel. To help the technician see and then push the panel in the correct spot a fluorescent light is often used to help see shadows that are created by the deformation of the dent. Repairs start at $75. We offer free esimates, just give us a call to schedule a time for one of our technicians to look at the vehicle. Can I get an estimate of the phone? Unfortunately it is impossible to determine the size, depth, sharpness and access to a dent over the phone... Our technicians will need to visually inspect your vehicle to determine an accurate estimate. Is PDR easy to do? Can I do it myself? 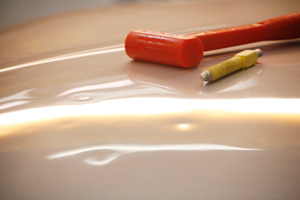 It takes a skilled technician to perform what is more of an art in repairing damaged auto body panels. An untrained person may think that it can be easily done and can make a dent much worse and impossible to repair if done themselves. Our senior PDR technician, Justin, has over 13 years experience in this type of repair and is the "go to" guy for a number of high end dealerships in Minnesota for luxury and exotic vehicles that require the highest level of quality and workmanship. Most dings can be removed in an hour or two. More substantial damage (such as a large number of hail dents) may take a number of days to repair. We would be happy to provide you with a price and timeline estimate at no charge, just call us to schedule an estimate appointment! Is PDR something new? Why have I not heard of it before? Will my insurance cover paintless dent rapair? Definitely! Insurance companies see the benefit of repairing hail damaged cars the PDR way! The car is restored to its original finish and the repair time is days rather than weeks.